High Borrans Self-cateringA delightful apartment for two with lake views from all main windows and a very pleasant air of comfort ideal for a relaxing holiday. High Borrans is just a short stroll from the lake shore and will suit couples looking for a quiet retreat in a most convenient location. This first floor apartment forms part of Borrans Court, a Lakeland stone former 'gentleman's residence', set in five acres of wooded grounds with ample room for sitting out on sunny days - there are many varieties of birds, whilst a quiet observer in the evenings may be lucky to see the badgers, deer and rabbits which are frequent visitors. Accommodation: The first floor level is reached via outside steps. Front door into inner entrance hall with hanging space for coats etc. The sitting/dining room has two tall windows both with views to the head of Lake Windermere to the south, and westwards to Loughrigg Fell (flat screen TV with freeview, free wi-fi broadband & DVD and video). There is a stone fireplace - coal-effect electric heater. Door through from sitting room into well-planned modern fitted kitchen with views to the gardens. Stylish bathroom with shower over bath, basin and wc. One double bedroom, again with a tall window and lake views. 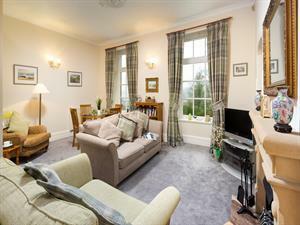 The property is stylishly decorated and furnished throughout, with co-ordinating soft furnishings and quality furniture. High Borrans has a light and comfortable feel ideal for a relaxing holiday at any time of the year. Fitted carpets throughout. Energy efficient thermostatically controlled electric heating. Outside: Private parking for one car. Communal gardens, garden chairs provided. Note: Sorry no room for a cot. A delightful apartment for two with lake views from all main windows and a very pleasant air of comfort ideal for a relaxing holiday. High Borrans is just a short stroll from the lake shore and will suit couples looking for a quiet retreat. No room for a cot. Children welcome from any age. High Borrans offers weekly bookings starting on Saturday. Electricity charged £10 per week, Apr to end Sep £15 per week Oct to end Mar.